Sometimes we need a reminder to realise just how far Muscular Dystrophy Australia’s support of the MD Community extends. The relationship between the MDA and RCH goes back some 26 years, when MDA was funding a dedicated MD Social Worker position to support our families. 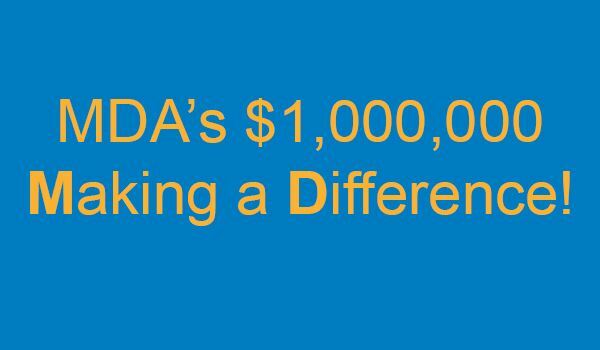 Ten years ago MDA committed to provide a significant increase in funding which facilitated the opportunity to create Australia’s, no, the world’s first dedicated “Muscle Clinic” or officially called MDA Neuromuscular Clinic in support of the MD Community. The new service delivery model saw a paradigm shift in how services were delivered. We now have the most cost and time effective program which provides profound benefits to families and individuals attending Muscle Clinic resulting in a win-win program. MDA’s provision of funding provided the opportunity to create a new and critical position which facilitated the opening of the MDA Neuromuscular Clinic. Daniella Villano had been working as a Paediatric Nurse as part of the Children’s Neuroscience Centre since 2004. In 2007, as a result of the funding support of the MDA, she commenced her role as the MDA Neuromuscular Nurse Coordinator – Advanced Practice Nurse. The role encompasses coordinating clinical research and clinical care through RCH’s Neuromuscular Clinic – it’s the only one of its kind worldwide. This role has been imperative to the development of both the neuromuscular clinical research program and neuromuscular clinic at RCH. Participation in the forefront of international neuromuscular research is a high priority for the neuromuscular team. Over the last 10 years Dani has managed & coordinated all of the neuromuscular clinical trials that have run at RCH. This involves being the link between different sponsors/drug companies and the hospital. Dani has managed all of the ethical submissions then implemented all of the protocols which generally involve many different staff members at the hospital. This role also includes being the direct contact for all the children and families participating in the trials. Developing the MDA Neuromuscular Clinic has been a major part of Dani’s role. As a result of the commencement of integral financial support from the MDA. The MDA Neuromuscular Clinic saw its first patients in February 2008 and more than 600 patients and their families have been seen in our clinic since that date. This clinic is quite unique in its function. As a consequence, many patients elect to travel from interstate to be managed and cared for at this site. Clinics are held every Wednesday afternoon in the specialty clinics at The Royal Children’s Hospital, Parkville. This multidisciplinary clinic brings together relevant medical specialties, allied health therapists and other health professionals. The team reviews progress and makes recommendations regarding the management of each child. We aim to continue to work directly with each child and family at the clinic, and are available as a resource for families, local doctors, community therapists, teachers and other clinicians who are involved in each child’s care. Dani’s role involves the day to day management of all staff that work within these areas. Most importantly, Dani’s role includes the management and coordination of each patient and family’s care that attend clinic. Dani is the point of call for all families & works to support their individual needs. “So next time you see MDA conducting National Superhero Week, our annual Fun Run, ChallengeMD! or some other fundraising activity, consider supporting it in the knowledge that we ARE the “market leaders” supporting the MD Community and more than $1,000,000 has been invested in providing the world’s best support.” said MDA Executive Director, Boris M Struk. Your support of MDA can Make a Difference!